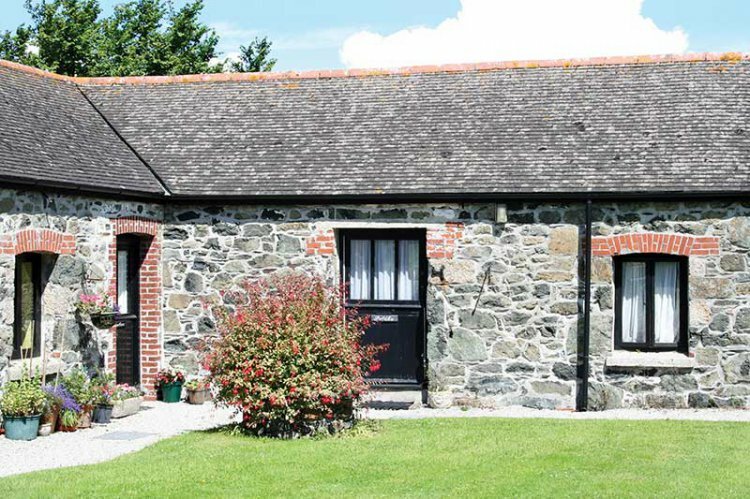 'Poldhu' is one of a group of barn conversion cottages, set around a communal courtyard only a one minute walk to the shops, restaurants and pubs etc. in the centre of Mullion village. Having been completely refurbished and decorated, Poldhu is in excellent order and makes a very comfortable cottage for two people. Off-road parking for one car is provided in the gravel parking area, steps lead from the carpark down to the courtyard and across gravel paths to the property. Entered from the courtyard into the bright, fresh Lounge. With open beams and high ceiling, having comfortable three-seater settee, flat screen TV/ DVD combi, log effect electric stove and French doors onto the patio area with table, chairs and far-reaching rural views. The Kitchen is new and fully fitted with electric oven and 4-ring hob, extractor, microwave, fridge with ice making compartment, dining table and chairs. Bathroom has matching bath, toilet and handbasin, shower over the bath and heated towel rail. The Bedroom has rural views, two, 3' pine single beds with bedside table and lamps and double wardrobe. Bedlinen and electricity are included in the rent. Sorry, infants or children under the age of 14 are not accepted at this property.